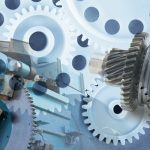 Plastic gears can provide a high-torque, high-speed, cost-effective solution for a host of demanding applications, according to the experts at Kleiss Gears. 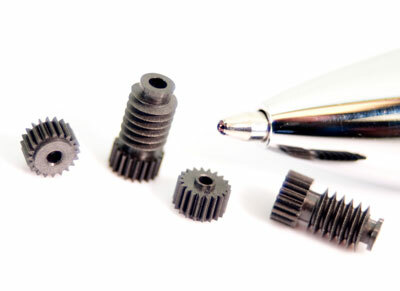 Plastics have numerous advantages over metal for miniature gears. One major and significant advantage is that molded gears can be smaller, and with higher accuracy than metal gears. Cut gears can reasonably reach only about 200 DP or .125 module. 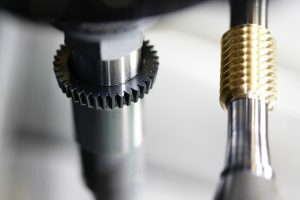 Kleiss Gears has molded gears 50-percent smaller than that, with length to diameter ratios that would make cut gears difficult to manufacture and cost prohibitive. 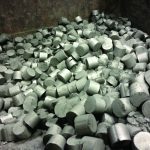 The molding process can also help solve problems associated with parts handling, inspection, and assembly, which become increasingly difficult the smaller the gears become. Kleiss Gears integrates these subsequent steps into the manufacturing process as full automation, to achieve the required accuracy and cleanliness. After the gear is molded, a robot removes it from the mold. A camera detects part presence and confirms an approximately correct shape. A robot can then drop the gear in a bin, place it in a blister pack, separate it for further inspection, or present it to automated assembly equipment. This handling choice is very important because micro-miniature parts can be quite difficult to re-register in an automated system once they have been released. 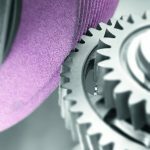 A gear manufacturer will likely discover that inspection of very small parts is technically challenging. For example, a gear tooth that has a 0.25mm whole depth should have approximately 2µm flank accuracy. Physical scanning with touch probes, even very small probes of 0.2mm in diameter, can still appear relatively large to such a very small gear. This translates to an inability to scan the root between gear teeth. Vision inspection systems measure some features quite well, but they are not a complete answer. Molded edges are almost never sharp, and accurate inspection requires edge detection because micro parts must have micro tolerances. Even a large plastic gear must be inspected carefully and the results considered judiciously. Plastic is a soft material, and the pressure of a small probe may indent the material and indicate a size smaller than the actual part size. If the indentation amount is known it can be mathematically compensated, but in general it can be avoided by using light forces and faster scan rates. This in itself becomes a challenge in inspection because a probing force of only a few grams requires heightened scanning control. If the force changes by that few grams while turning a corner on the part, the probe will lift off the part and scanning will terminate. Only a few scanning CMM models in the industry remain stable with such very light forces. 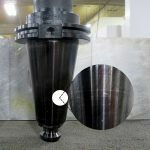 Similar requirements apply to roll testing molded gears. 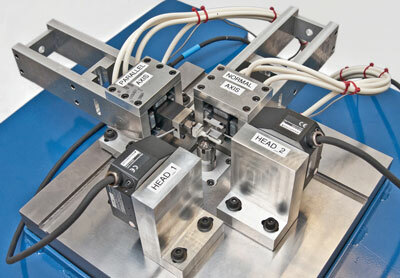 The usual practice in roll testing is to apply a minimum eight ounces of force for the duration of the roll test. This can yield an incorrect result for small plastic gears because of plastic’s softer quality. Depending on the size of the gear, we vary forces from one to four ounces for an accurate representation of actual size (Figure 2). We expect the roll test to correlate closely to the size indicated by profile inspection. 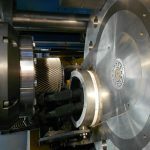 Roll testing has the added benefit of sensing the whole surface of the gear instead of the two dimensional scanning surface measured with a CMM. Such whole surface scanning reveals molding flaws such as flash, tooth distortion, handling damage, and even shrinkage error to some degree. 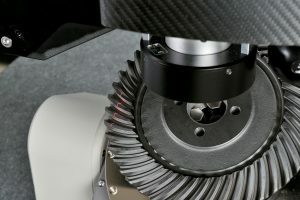 Without special setup and master gear selection, however, a roll test will not reveal errors of form like barreling, hour-glassing, and taper. 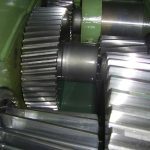 Roll testing alone does not adequately inspect molded gears. 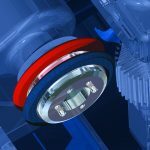 One reason is the effect of shrinkage error in roll testing. For example, although roll testing can detect base pitch shrinkage via tooth-to-tooth error well in gears with less than 30 teeth, a greater number of teeth in mesh increasingly masks such error. This is because tooth count increases contact ratio. The roll test will indicate merely an increased center distance, which can result from variances in tooth thickness, tilt, or base pitch, among other features. Even a base pitch that is smaller than designed will cause increased roll test center distance. This is because any change in base pitch will result in a mismatched pitch and push the gear away from the master gear. 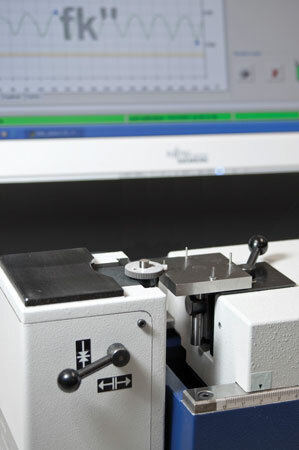 Therefore, once roll testing indicates a possible problem, the inspector must return to profile scanning to pinpoint the source (Figure 3). 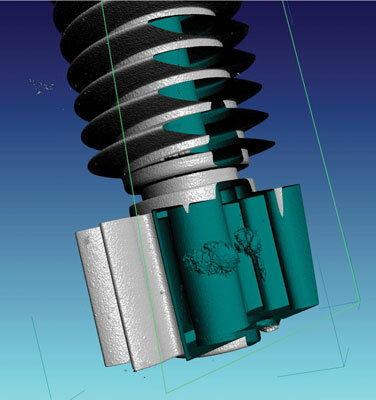 A recent advance in metrology that may have significant value to the gear designer is computer tomography, or CT scanning. The medical field has used this technology for some years to create 3D images of internal organs. In the past few years the technology has been applied to dimensional scanning of parts. It is particularly suited to molded gearing. CT scans can detect voids, fiber orientation, surface defects, contamination, and a variety of other gear features. A scan can establish surfaces and represent them with point clouds for metrology analysis. 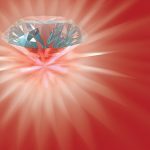 The current accuracy of this technology is approximately 10µm, but its continuing and rapid evolution means that accuracy is bound to improve as the method’s value gains greater recognition (Figure 4). 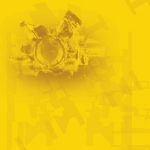 Another method of inspection that we embrace is what we call “inspection through testing.” Transmissions are by nature complex mechanisms with intense interactions between components. 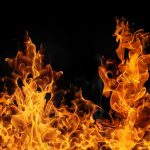 One could spend large amounts of time and energy inspecting individual components and still end up with a non-functioning device, because the failing features simply were not looked for. Building the transmission and an automated tester for that transmission can readily solve the problem. Drive it with a calibrated motor. Put on a regulated load. 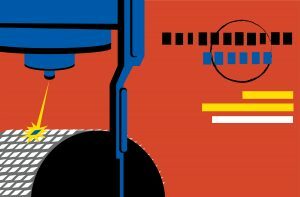 Sense the torque, speed, efficiency, and compliance of the transmission under load. 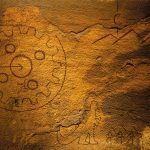 This produces a signature of the operating functionality of the unit. In the design phase, this will confirm or repudiate design expectations. In production, a continuation of the test on the product line will confirm system functionality. Testing is often a necessary complement to inspection. 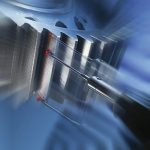 Especially when the transmission operates in several axes, such as transmissions with worm gear meshes, testing proves invaluable for understanding the dynamic relationship between the various geared components. As shown in Figure 5, the tester is usually fully automated with calibrated drivers, loads, speed sensing, and any unique output sensing that may be required. 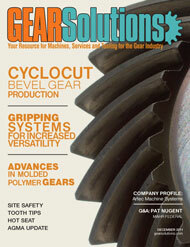 Plastics and plastic gears bring new opportunities to transmission designers. 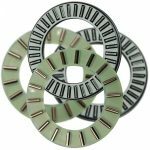 They also bring challenges and new requirements for confirming accuracy and functionality, especially in the micro-miniature world of gearing. 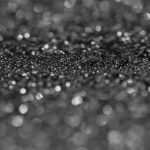 Although new tools for production, inspection, and testing are continuously being developed, the real challenge is being smart enough to use those tools effectively for better, smaller, stronger plastic molded products. Photography by Melanie Boerger, mkboerger@gmail.com.